Auntie NaNa loves these two! One year ago today we brought Jude and Sophie out of the orphanage. We took them to lunch. We went to the Embassy to submit our final batch of paperwork. We had ice cream. We played soccer. We gave them baths and tucked them into bed. We were their parents. And we loved it. And every day since that day, we love it even more. In the past 365 days we’ve had lots of ice cream, played lots of soccer, given bubble baths and tucked them in each night. Today we are more amazed than ever that our infinitely kind, creative, and generous Heavenly Father has blessed us with these beautiful children. And we love that we will be Jude and Sophie’s parents, every day for the rest of our lives. This is a big week in the Whitacre home. One year ago today Steve and I landed in Addis Ababa, Ethiopia. 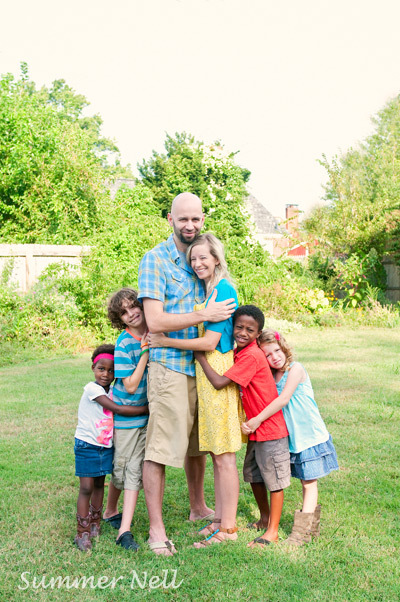 Tomorrow, February 28, we will celebrate “Gotcha Day”—the day we brought Jude and Sophie out of the orphanage. And Saturday marks the first anniversary of what we have declared “Whitacre Day”—the day our little family was finally all together, complete. Jude and Sophie’s names—like the children themselves—were chosen long before we met them. They express so much of what God has done in bringing them into our family. We wanted to name our son Jude after my dad preached a series of messages on this short book of the Bible during the same month we applied to our adoption agency. Under attack from false teachers, Jude urges the believers in Christ to stand firm and put their hope in God “who is able to keep you from stumbling and to present you blameless before the presence of his glory with great joy” (Jude 24). We named “Jude” in praise to God for his sustaining grace in our lives, and as a prayer that our son will come to know our faithful God who is able to keep him to the end. Also, Jude’s name is a derivative of Judah, and the fact that “The Lion of Judah” graces Ethiopian currency is a small but significant reminder of his heritage. And Jude, eight-year-old boy that he is, likes that his name has something to do with a lion. Sophia, of course, means wisdom. As I am fond of telling her: “I asked God for wisdom and he gave me Sophie.” Following the two difficult deliveries of our biological children, Steve and I were still desirous of having more children but were unsure if it was safe for me to risk my health and maybe even my life. There were many questions and no clear answers. This was a wisdom issue. But many Scriptures did apply, and when we asked, God was faithful to provide all the wisdom we needed in His Word and the counsel of doctors and other believers. “If any of you lacks wisdom,” it says in James, 1:5, “let him ask God, who gives generously to all without reproach, and it will be given him.” Sophie’s name is a reminder of the wisdom God gave to us that led us to her, and I pray she will grow into her name and become a wise young woman who follows the Savior. Recently, I looked out my window and saw Jude playing his own imaginary game of football (the American kind) in the backyard, complete with his own play-by-play. “Jude Whitacre scores!” he yelled triumphantly as he carried the football in for a touchdown. I really like the sound of that, son. I thought. Jude and Sophie’s names express our praise to God and our prayers for their future. They also describe our first year together as a family. God has truly been faithful to sustain us and we marvel at his perfect wisdom in bringing these two precious children into our family. We love you Jude and Sophie! All the boys in our family have recently spent hours listening to the action-packed Jonathan Park radio drama adventures. From the website: The adventures follow Jonathan Park, son of paleontologist, Dr. Kendall Park. While running from a storm, Jonathan and his father collide with the Brenan family as they seek shelter in a hidden cave. After discovering a massive dinosaur graveyard that shows evidence for a worldwide flood, these two families have combined forces to build a new museum, open the fossil discovery, and the hidden cave to spread the message of the Creator! Updated from the Picture Bible my sisters and I grew up with, the Action Bible now includes dramatized audio. A wonderful way to introduce kids to the drama of Scripture and it has already sparked many a spiritual discussion amongst the cousins. As soon as the boys get out of school on Monday afternoon, they ask: “Is the podcast ready, yet?” They can’t wait to listen to Pop-Pop and Uncle Chad talk sports and as a mom I love that they are learning about sports from a biblical perspective.